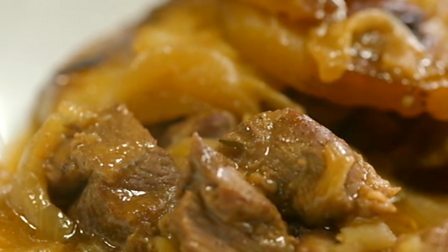 Mutton might not be as popular as it once was, but it’s the traditional – and most flavouful – meat to use in hotpots. Using the rendered suet fat from around the kidney adds even more taste. Trim the fat from the kidneys and place the fat into a large ovenproof casserole and cook over a medium heat until the fat begins to melt and is golden-brown. Sprinkle the mutton all over with the flour. Add half the mutton and kidneys to the casserole and cook until browned all over. Remove from the pan and set aside. Add the remaining meat and cook until browned all over, then add half the onions and the bay leaves. Top with the reserved mutton then the remaining onions. Add the Worcestershire sauce and stock and bring to a simmer. Arrange the potato slices on top in an overlapping pattern. Season the potatoes with salt and pepper and add a few dots of butter over the top. Cover with a tight-fitting lid and cook for two hours in the preheated oven. When cooked, you can brush the potatoes with a little more butter, then place under the grill to crisp up if you like. Alternatively, increase the oven temperature during the last 30 minutes in the oven and remove the lid. When the hotpot is cooked, bring a pan of salted water to the boil. Add the carrots and simmer until just tender, about 3-5 minutes. Drain and toss with the remaining butter, salt and black pepper. Serve a pile of hotpot on each plate with some carrots alongside.